Our motorcycle accident lawyers at Rechtman & Spevak are warning Georgians that motorcycle accident deaths are on the rise across the state, and there are steps that can be taken to prevent devastating injuries and tragic loss of life caused by motorcycle crashes. Statistics show that a large majority of motorcycle accidents in Georgia and around the country occur when an automobile driver fails to see a motorcycle or misjudges a motorcycle’s turning and slowing capabilities, often the result of the other driver’s negligence, inattention or reckless driving behavior. If you have suffered serious injuries in a Georgia motorcycle accident, contact our skilled motorcycle accident lawyers at Rechtman & Spevak to explore your compensation options. In 2008, 12% of all motor vehicle fatalities in Georgia involved motorcycle riders, which represents an increase of roughly 59% since 2004. According to the National Highway Traffic Safety Administration (NHTSA), nearly 2,000 motorcyclists survived accidents in 2008 because they were wearing helmets, and more than 800 additional lives could have been saved if helmets had been worn. In light of these statistics, our motorcycle accident attorneys at Rechtman & Spevak are encouraging beginner and veteran motorcycle riders alike to take part in motorcycle education programs designed to keep riders safe. One such program is the Georgia Motorcycle Safety Program (GMSP) offered by Georgia’s Department of Driver Services, which incorporates “Share the Road” campaigns and crash-avoidance training. Although there are a number of factors that contribute to the incidence of Georgia motorcycle accidents, automobile drivers increase the risk of these types of crashes by speeding, following too closely behind a motorcycle, driving under the influence of alcohol or drugs, and by making unsafe maneuvers with their vehicle, forcing the motorcycle rider off the road or into traffic. Far too often, the result of risky driving behavior like this is fatality, and the motorcycle rider is more commonly the victim than the driver. In fact, motorcycle riders are about 26 times more likely to be killed in an accident than someone riding in a passenger car, and are five times more likely to be injured. Motorcycle accidents can result in death or injuries ranging from road rash and broken bones to life-altering spinal cord injuries and traumatic brain injuries. 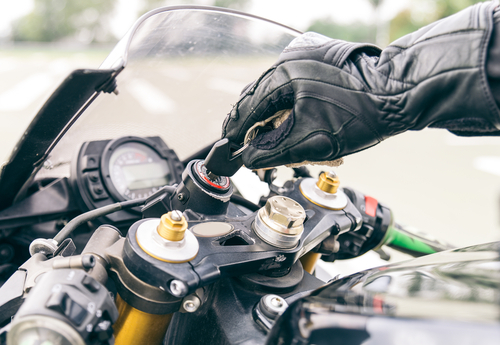 Like most instances of motor vehicle accidents, motorcycle crashes are typically governed by the legal concept of negligence, which is the basis for holding a person legally responsible for any harm resulting from a collision. If you have been injured in a Georgia motorcycle accident caused by another driver’s negligence, contact our motorcycle accident attorneys at Rechtman & Spevak to discuss your legal options. You may have grounds to file a personal injury lawsuit against the person found at-fault in the accident, in order to pursue financial compensation for your injuries, medical bills, and other losses related to the accident. With our knowledgeable motorcycle accident lawyers on your side, you can hold the allegedly negligent driver liable for your injuries and protect yourself and your family from further harm.